I try to be a good host, but I find it difficult to make small talk, offer drinks and hand out the canapes to everyone, all at the same time. 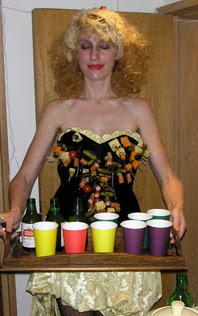 This cocktail dress seems to solve the problem. I could carry the tray, and the guests picked the food straight from my breast and felt welcomed without words. 1 packet of 1 1/2 " nails with big heads on. Cocktail sausages, gherkins, cheese, pineapple, stoned olives, cherry tomatoes. 1. Stick nails through the dress from front to back, in some sort of design that will suit you. 3. 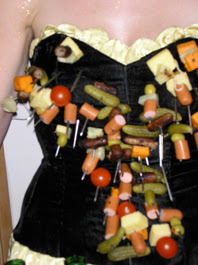 Put dress on, and place the food on the nails. Get a friend to help you, it's easier.